The Aces must forfeit their WNBA game Friday at the Washington Mystics after deciding not to play because of concerns about their health and safety after almost 26 hours of travel. The Aces lost twice Tuesday. In the morning, the WNBA ruled that they must forfeit their game Friday at the Washington Mystics after deciding not to play because of health and safety concerns following almost 26 hours of travel. Then, on Tuesday night, Las Vegas fell at the Atlanta Dream 109-100 to finish their road trip 0-3. Counting the forfeit, the Aces are 0-4 since the All-Star break and have allowed more than 100 points in the three defeats on the court. The losses dropped Las Vegas to 12-17, 2½ games behind the Dallas Wings for the eighth and final playoff berth, with five games remaining. The first is Thursday against the Minnesota Lynx at Mandalay Bay Events Center. The forfeit is the first in the WNBA’s 22-year history, the result of the first cancellation of a game in league history. “We worked extensively with both the Aces and Mystics to come up with a workable solution,” WNBA president Lisa Borders said in a statement. 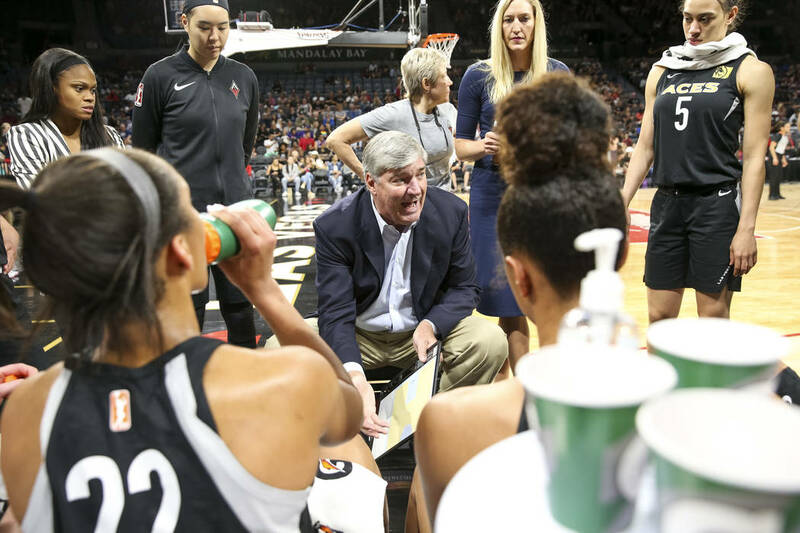 “In the end, given the limited number of days remaining in the season and arena availability, we decided to delay the start of the game until 8 p.m. (EDT) to give the Aces as much time as possible between their arrival in Washington, D.C., and tipoff. Las Vegas coach Bill Laimbeer said in a statement that the Aces disagreed with the decision but would move on. The Aces spent more than 25 hours traveling from Las Vegas to Washington on Thursday and Friday before arriving about 4½ hours before the scheduled start of the game. After congregating at the team hotel, the Aces, in conjunction with the Women’s National Basketball Players Association, decided not to play. Aces center Carolyn Swords, the team union representative, explained the decision Saturday in a phone interview, acknowledging that the Aces knew the league might penalize them but saying their health and safety were more important. The team left Washington on Saturday for Uncasville, Connecticut, where it endured a 109-88 loss to the Sun on Sunday. Connecticut guard Layshia Clarendon, the first vice president of the WNBA executive committee, defended the Aces’ decision and expressed hope that it might lead to changes in travel. The NBA’s collective bargaining agreement, for example, includes a provision that prevents teams from playing a game on a day in which they traveled across two time zones. There is no such provision in the WNBA’s collective bargaining agreement. The Aces traveled across four time zones.